G Series loaders, D Series excavators drive production for massive mulch producer. Britton Industries is a leading producer of natural and dyed mulches, screened topsoil, leaf compost and aggregate products. 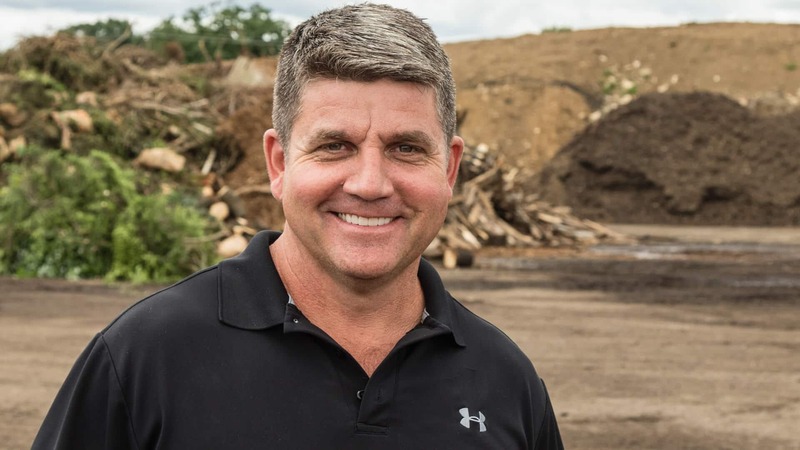 Servicing the landscaping and construction markets of Central New Jersey and South Pennsylvania, the family-owned and operated company has been in business for over 28 years. 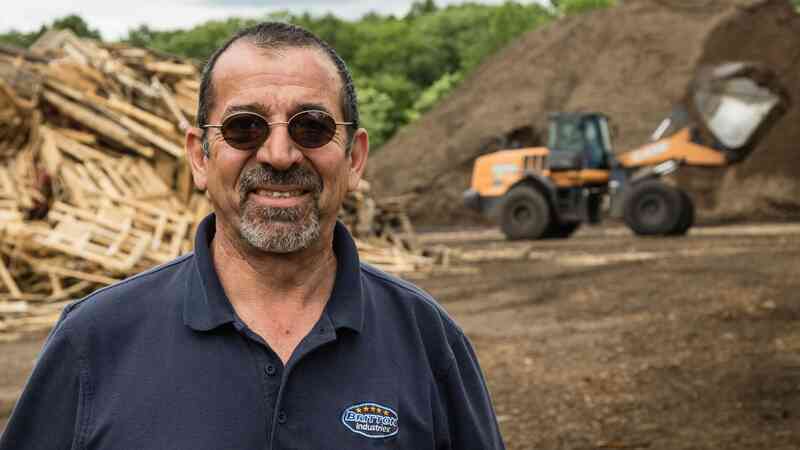 The company operates a full wood product recycling center as well as a concrete recycling center—making crushed concrete for fill, as well as decorative stones and other products. 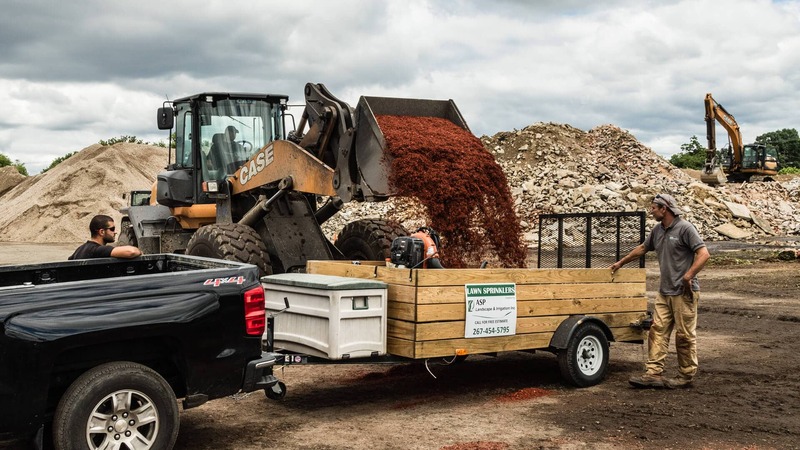 They also produce and distribute a variety of custom soil blends for contractors and serve as a convenient disposal center for area businesses and homeowners. In order to stay competitive, the company’s prices have to remain relatively fixed, so Britton needed to find other ways to increase profitability. With over 100 employees and several hundred pieces of equipment operating across four busy locations for 12+ hours a day, six days a week, having the right equipment on site can make a significant difference in operating costs. New, reliable equipment with planned maintenance contracts and predictable owning and operating costs can help improve productivity and boost efficiencies for any business. Britton Industries has recently worked with local CASE dealer Groff Tractor—a company that has been serving the construction market in the Mid-Atlantic since 1958—to purchase several new CASE wheel loaders and excavators as part of a new consolidation/standardization strategy. The ability to control and predict ownership costs throughout the lifecycle of a machine allows equipment owners to make smarter decisions about machine investments and allocation. All seventeen of Britton’s new machines—nine 821G wheel loaders, four 921G wheel loaders, and four CX250D excavators—came standard with CASE ProCare. ProCare includes a three-year, 3,000-hour full-machine factory warranty; three-year, 3,000-hour planned maintenance contract; and a three-year Advanced CASE SiteWatch™ telematics subscription. Britton has seen a demonstrated difference in productivity and uptime since implementing their new equipment acquisition strategy. When every truck in and out of a facility affects the bottom line, downtime on any piece of equipment has a domino effect. Another key advantage to CASE’s ProCare is the three-year SiteWatch telematics subscription. Remote monitoring of equipment via telematics gives owners insight into the performance of their fleet, as well as the ability to analyze long-term utilization trends. Working in a high-production environment that processes wood products, yard waste and other dusty, potentially combustible materials can create several challenges with certain types of Tier 4 machines—particularly those that require a high-temperature regen cycle to burn off excess particulate matter. 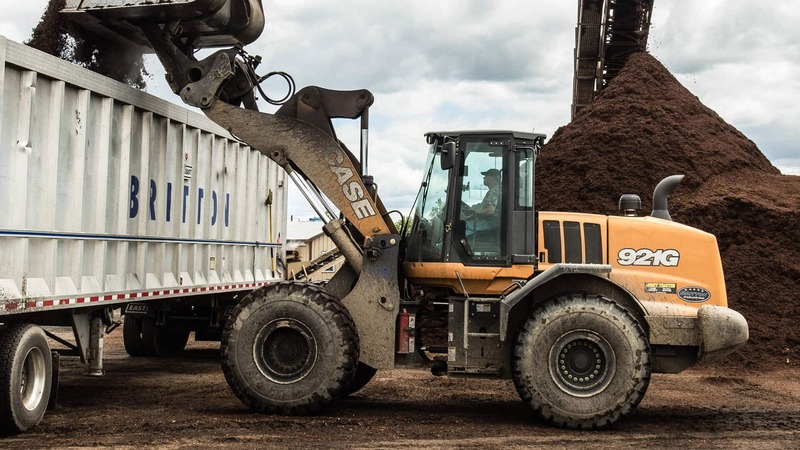 CASE was the first manufacturer to employ SCR (Selective Catalytic Reduction) technology in heavy earthmoving equipment – and G Series wheel loaders are the second generation of CASE wheel loaders to benefit from the fuel efficiency and cooler operating temperatures provided by the technology. There is no regeneration cycle, no recirculation of exhaust gasses, and no temperature spikes to burn off particulate; all of this ensures that a greater percentage of fuel use is put towards productive work, and the lower operating temperatures greatly reduce the likelihood of dangerous thermal events in dust-laden environments. 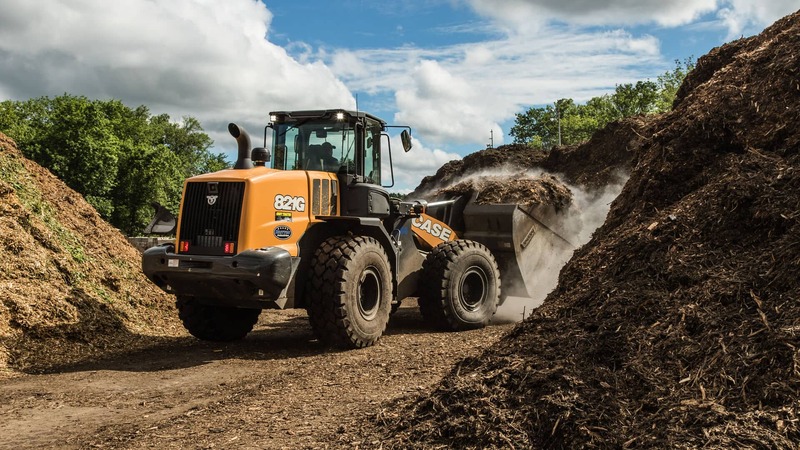 All CASE wheel loaders also feature innovative cooling technologies that keep operating temperatures down, keep the engine compartment clean and provide easy access for routine cleaning. Models in the 131-225 HP range feature a CASE-exclusive mid-mounted cooling module, which pushes the engine lower and further back towards the rear of the machine, improving balance and stability. The G Series wheel loaders provide a variety of additional features geared towards achieving optimal cycle times and productivity, including four selectable power modes, ride control, and standard automated bucket controls such as return-to-dig, return-to-travel and height control. 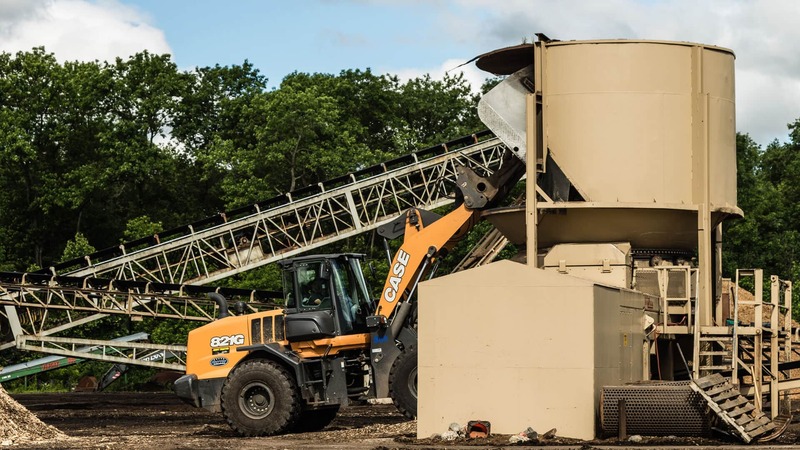 Even simple considerations like easily-exchangeable buckets (made possible by the standardization of a single loader type) can make a big difference in productivity for companies like Britton Industries. The cab and operating environment of the G Series have been designed to provide optimal operator performance, ergonomics and engagement with both the controls and the machines’ surroundings. The spacious cab features a new 8" LCD monitor providing the operator with simple control and greater insight over many loader functions and activities. Advanced electro-hydraulic controls, and numerous seat and adjustability options further simplify operation and training. A one-piece rounded windshield and optimally placed mirrors, along with a rearview camera that feeds directly to the monitor, ensures full 360° visibility. With a large staff of equipment operators, the ability to fine-tune the cab to an individual operator is also a benefit. 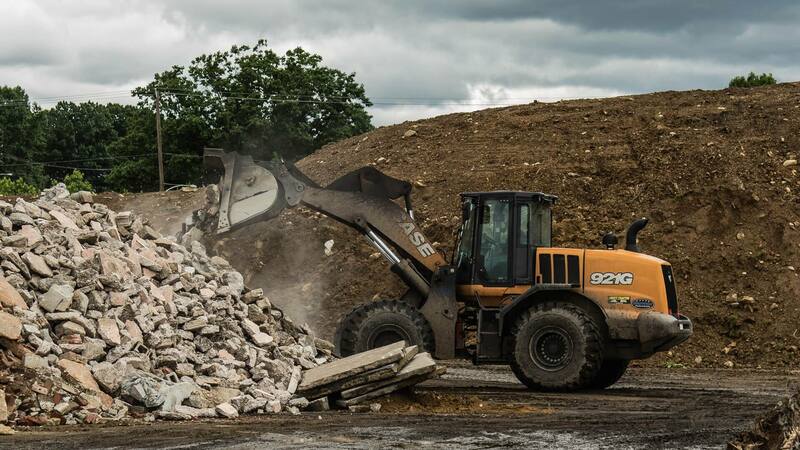 In addition to purchasing 13 CASE G Series wheel loaders, Britton Industries also purchased four CX250D excavators for their concrete recycling operation. Weighing just under 57,000 lbs., the CASE CX250D is a full-size Tier 4 Final excavator featuring a 177 Horsepower Tier 4 Final Certified engine, and provides bucket digging forces of up to 36,419 foot-pounds. The CX250D meets Tier 4 Final emissions standards through a combination of cooled exhaust gas recirculation (CEGR), selective catalytic reduction (SCR) and diesel oxidation catalyst (DOC) technologies, which helps maximize uptime and performance – all with minimal maintenance. There is no diesel particulate filter, no regeneration cycles or associated lifetime service costs associated with other types of after-treatment systems. Faster cycle times are the result of a new, electronically controlled pump, a larger control valve and multiple electronic sensors. These features and the rest of the CASE Intelligent Hydraulic System make the best use of the machine’s hydraulic power and momentum.